The HM-F Series of turbine flow meters can handle low viscosity fluids flowing under extremely high pressure, such as hydraulic and fuel systems and offshore chemical injection systems. Best for use with hydraulic oil, fuel and other light oils when ANSI or tri-clamp flanges are required. The HM-F series of turbine flow meters can handle low viscosity fluids flowing under extremely high pressure. 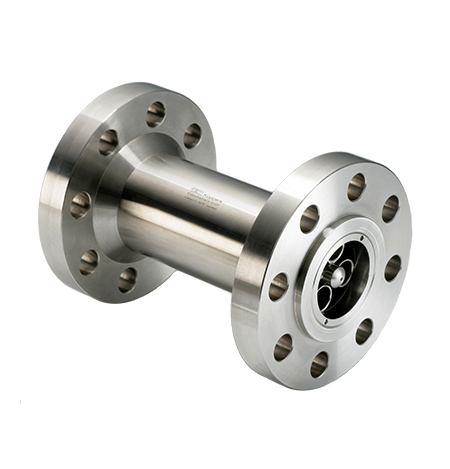 They are best suited for use with hydraulic oil, fuel and other light oils when ANSI or tri-clamp flanges are required. The turbine wheel’s low moment of inertia allows a fast acceleration from standstill up to full number of revolutions within 5 to 50 seconds, making dynamic measurements possible. This meter comes in twenty different flow ranges to meet your system requirements, from 0.008 to 12,000 gallons/minute. Fast Response Time & High Resolution: The Turbine wheel’s low moment of inertia allows a fast acceleration from standstill up to full number of revolutions within 5 to 50 sec. For that reason, dynamic measurements can be made. The resolution can amount to as much as 35,000 pulses per liter. Wide Temperature Range: Standard turbine: -4 up to 248°F Special models for cryogenic liquids: -459°F Special models w/ hi-temp pickups: up to 662°F. Low Contamination Risk :The spacing of the turbine wheel and bearing mount is wide enough to protect against particles in fluid jamming the turbine wheel. And the Twist of flow in this area has a self cleaning effect for the bearing.